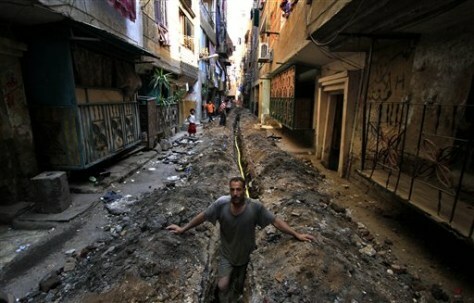 A worker stands in a ditch for a cooking gas line in an alley in the crowded neighborhood of Mit Oqba in Cairo. All over Egypt, dozens of Popular Committees have sprouted, each dedicated to bringing the can-do spirit of Egypt's revolution to a neighborhood. But the committees are running up against former local officials under the Mubarak regime who still hold considerable power, showing that the old regime is alive and well in the new Egypt.